My eleven year old daughter and I went blueberry picking. The farm that we picked the berries at is only a few miles from our house. We both enjoyed our morning together in the blueberry field and we came away with a lot of blueberries. I love fresh from the field berries. They are so much better than the ones that you buy in the store. I will be posting soon what I made with the blueberries. I tried several new recipes that turned out really well. 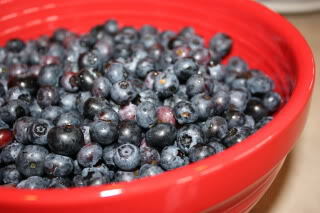 I love fresh picked blueberries! ohhhh I am jealous!! I love eating blueberries fresh from the field!! Fresh blueberries are one of my favs! I’m looking forward to the recipe you will share soon.